Field Spaniel and Cocker Spaniel were, at one time, one and the same. In any given litter, the larger pups were called Field Spaniels, and the smaller dogs were called Cockers. The relationship doesn’t end there, however. The breeds known today as English Springer Spaniels, Sussex Spaniels, English Cocker Spaniels, and American Cocker Spaniels are all descended from the ancient, related spaniels that were simply called Spaniels in England. The dogs that eventually became Field Spaniels lived through some grave disservices on the part of a few breeders. Phineas Bullock of England took some dogs of Field Spaniel heritage and created dogs that had very low and long bodies and heavy bones. These dogs were still spaniels but looked nothing like any other spaniel in existence, and many people called them grotesque. It took considerable effort by dedicated breeders in England and in North America to re-create the balanced, athletic Field Spaniel known today. The Field Spaniel dogs stand 17 to 18 inches tall and usually weigh between 35 and 50 pounds. The body is slightly longer than tall, well balanced, and moderate in everything without any extremes. The ears are dropped, and the tail is usually docked. The coat is a single coat (with no undercoat) and moderately long. The chest, belly, back of legs, and ears are feathered. The coat is black, liver, or golden liver. This breed is not as heavily coated as the Cocker Spaniel, but it does need regular brushing and combing to prevent mats. The ears, insides of the ears, paws, and under the tail should be trimmed regularly for cleanliness. Many pet owners have the dog groomed (including a haircut) to make daily care easier. Although not a highly active breed, the Field Spaniel does need daily exercise. She enjoys a good walk but will also need a chance to run and play. Field Spaniels can train on the agility course, run alongside a bicycle, or go jogging with you. This breed has excelled in many performance sports and has become a favorite of many serious competitors. Early training and socialization are very important. The training should begin early, both to instill a joy of working within the dog and to establish household rules, as this breed can have a stubborn streak. The Field Spaniel dog breed can be wary of strangers; early socialization can help develop a trust of people and prevent shyness. The Field Spaniel can be a good family dog and pet when she has a job to do. If someone in the family enjoys training and likes to hunt or participates in canine performance sports, this breed will suit wonderfully. Without a job or sense of purpose, the dog might amuse herself by getting into trouble. This breed likes to spend time outside and will enjoy a large yard to run around in and investigate. She also likes to be with the people in her family and, when inside, will keep herself close. Owners often call their dogs Field Shadows. She is patient with children. When well socialized, she is good with other dogs. Health concerns include eye and eyelid problems, hip dysplasia, and hypothyroidism. 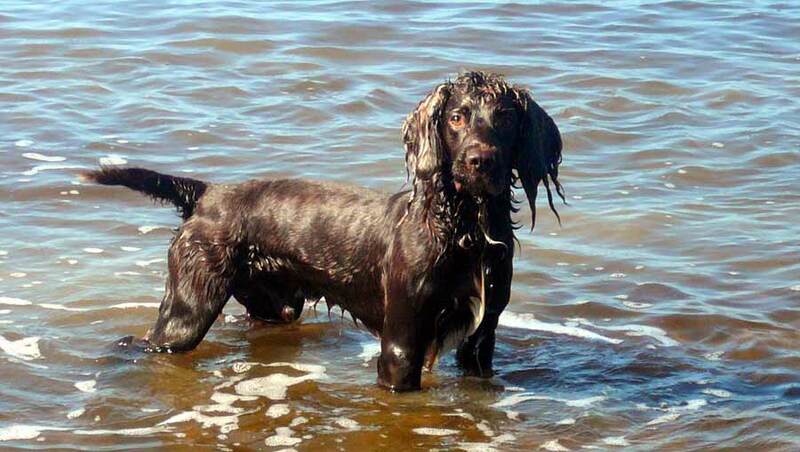 Share your Field Spaniel story. Note: Upload only Field Spaniel picture or your picture with Field Spaniel below - spammer's ip may be blocked. Levelheaded and mild-mannered, the Field Spaniel has more sporting instincts than most other spaniels and appreciates as much running, biking, hiking, or field work as you can provide. It isn’t fair to keep this lively little hunter, bred for activity and endurance, in a small yard with only a walk around the block for exercise. When socialized early and extensively, he is accepting of strangers, though he seldom runs right up to people as might a Cocker or Springer. The Field Spaniel is typically playful and docile with other animals. Field Spaniels do have an independent streak but respond well to light-handed, upbeat training methods. This sensitive breed cringes or withdraws when treated roughly or jerked around. Some enjoy hearing the sound of their own voices. The fun-loving Field Spaniel enjoys splashing in puddles and slobbering in water bowls and will track mud around the house with his oversized webbed feet.